The Match of the Round for the PlayStation®4 National Premier League opened at Cooks Square Park, where Maitland welcomed Hamilton Olympic in what proved to be a closely fought ninety minutes. The game kicked off at a slow pace and it was clear that both teams were settling back into the premier league pressures, until Hamilton were able to establish a dominance early with an attack on Maitland’s goals. Although the attack down the left wing gave Jacob Bailey a thundering chance early on, Maitland’s Matthew Trott made his presence known on the field, making a key save with a dive to keep Maitland in the early game. It looked clear that Maitland were happy to sit deep and absorb the pressure that Olympic were mustering, but the strategy proved successful in front of their boisterous crowd, with both sides recording the same amount of shots on target early on. Matthew Comerford was the key player leading the counter-attacks, finding space in the middle of the park to create attacks and threaten Hamilton’s backline however with Kyle Hodges keeping his defence steady and showing why he’s one of the top defenders in the competition, the chances came to nothing. The left wing of Hamilton’s attack was the focal point of the travelling side, a foul was made outside the eighteen yard box that Leo Bertos almost delivered into the back of the net, but once again Blake Thompson was holding the backline strong and the chance was cleared. Maitland’s first clear cut chance came with Matthew Thompson taking a free kick from the left flank, but the shot failed to dip, sailing over the top of Hamilton’s bar, without troubling Hamilton’s keeper, Danny Ireland. It was a tale of two keepers in the match, with another brilliant shot coming off the boot of Daniel Bird, who almost placed it perfectly into the bottom left side of Maitland’s net. Trott was able to get a hand on the slow-moving ball and send it wide of the post. The ball found the back of the net for Hamilton off a corner, but with a Maitland player taken out in the process the goal was disallowed, keeping both teams fighting for the three points. As the time ticked down, the attacks became more lethal, with both Bertos and Kane Goodchild pressuring the Maitland goal, but Thompson along with Trott and kept the sheet clean for Maitland. Maitland had three rapid-fire attacks at the end of the game in added time, but with two jaw-dropping saves from Ireland and an inch-perfect interception from Hodges the game finished goalless. A point a piece was a result Maitland’s Steve Piggott was happy to open the season with. “The long wait for the season is finally over and the matches are finally here,” he said. With defensive masterpieces at either end of Cooks Square Park, the point-apiece will be a strong foundation for both sides to build upon and their eyes will now turn to the chance for all three points next weekend. Maitland takes their squad away from home for the first time in the season, travelling to Valentine’s Cahill Oval. With Valentine the newcomer on the scene, Maitland will look to take three points off the fresh side and secure a strong start to their campaign. Hamilton meanwhile will play their first home game, with Darling Street Oval hosting Adamstown Rosebud on the evening of Saturday 16th April as both teams look for their first win of the season. The opening match of Round 1 was played at Arthur Edden Oval with the Lambton Jaffas hosting defending champions, Edgeworth. With the first half going goalless, both sides got on the sheet with John Majurovski proving why he is one of the deadliest attackers in the competition for Lambton and Ayden Brice making his name once more for Edgeworth. It looked set to be a draw for both sides, a result that Lambton would have happily taken against the team that claimed the double last season, but Keanu Moore was the hero for the defending champions, netting a late goal to take the three points for them and leaving Lambton disappointed after the ninety minutes. “I think after their early goal they camped in their half, so we did really well to break them down over the ninety minutes. I think we were the side that deserved the points,” Zane said of the performance. Backing up their late win, Edgeworth will now play at Jack McLaughlan Oval next weekend against the Weston Workers Bears, kicking off late on Friday night. Next weekend Lambton travel to Magic Park on Sunday afternoon and with Broadmeadow looking dangerous, the Jaffas will need to be on top of their game if they are to take points off their rivals. A six goal thriller was hosted by the Weston Workers Bears at Rockwell Automation Park, as the Newcastle Jets Youth squad travelled to take them on in the season opener. A mistake from Weston’s Will Myers saw him get caught on the wrong side of the goal mouth as the Jets’ Youth striker, Cameron Joice, put one into the back of the net. Weston looked determined to regain the lead and Gary McDermott took the chances given to him and buried two goals without a reply at the home ground, but the one goal lead was all they could manage before half time. The Jets continued their attack in the second forty-five minutes where a second goal came to them by an own goal from the Bears, levelling the score. McDermott benefited from Robert MacBeth and Mic Ryan’s attacking runs, claiming his hat trick and putting Weston back into the lead, with their eyes on collecting three points in the first match of their season. It was not to be for Trevor Morris’ side however, as a penalty saw the Jets level the score for a final time in the match and the Newcastle Youth side left Rockwell Automation Park with a point under their belt. Morris was disappointed at their missed chances at home and thought that the Weston side could have claimed three points in the match. “We should have put the game to bed in the first half and we should have buried a few more chances,” he stated. Weston will look to claim their first victory of 2016, when they travel to Jack McLaughlan Oval, where the title-defenders Edgeworth will welcome them to another early season battle. The Jets, meanwhile, will play at Lisle Carr Oval against Charlestown in a bid to build on their recovery in the match this weekend and look to turn their one point into four points on the table. A grudge match that is watched from all corners of the Play Station 4 National Premier League competition saw Broadmeadow welcome Adamstown to Magic Park after a change of venues for the Rosebud’s improvements at Adamstown Park. Both sides had eagerly awaited the start of the season and the chance to get one over the other side. Peter Haynes and Kale Bradbery both found the back of the net early, putting Adamstown on the back foot in front of the Magic fans, who welcomed early goals in the season with open arms. The star of the match however was James Virgili, whose pace proved to be too much to handle for the Rosebud’s defenders, as he recorded a hat trick and put Adamstown well and truly out of the game. Although Bradbery found the back of the net again to claim a brace for himself, their clean sheet was broken late in the match as Adamstown took two goals back in the rout. Casarolli picked up a final goal for Magic to take the home side’s tally to seven and seal a convincing win. The massive victory for Broadmeadow took them straight to the top of the table for the opening weekend on goal differences, but coach Bobby Naumov was still not completely happy with his side’s outing in the match. “Even though we netted goals, there were still things that I didn’t like the look of, including two late concessions,” he commented. Next weekend sees Broadmeadow carry their deadly form into another home side battle against the Lambton Jaffas, who came within one goal of toppling Edgeworth in the first match of the year. Adamstown meanwhile will switch to recovery mode in their next ninety minutes, which comes in the form of Hamilton Olympic away from home – another tough fixture will show if Adamstown’s slip-up was merely a glitch on the radar, or a sign of worrying things to come. The final game of the opening round saw the newly promoted Valentine make the trip to Charlestown’s Lisle Carr Oval, where the Blues were waiting to test Valentine’s resolve. It looked like Charlestown were willing to lock Valentine out after an early mistake from the travelling side’s defence, when Sam Bradshaw put one on the scoreboard and took the lead at home. Half time saw the two sides level however, with Brenton Olzomer scoring a crucial goal for Valentine and shocking Charlestown back into action just as the sides were called into the sheds. 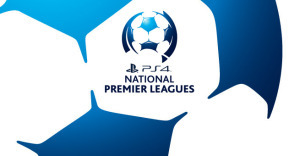 Although City returned to the field with attack in mind to break the deadlock, their forwards hit the post a number of times, but it was Ridge Marpu that found the back of the net next, giving Valentine their first lead to defend in the PlayStation 4 National Premier League for 2016. It wasn’t to last however, with a draw being the flavour of the round for the Northern NSW top division. Charlestown managed to bring the score back level in the late moments of the game with a set-piece header that Rene Ferguson was able to pounce on. With the draw hard to swallow, head coach, Darren Sills felt that his side could have claimed their first three points from the performance. “As a collective team we played really well, it’s good to come out and have a go in the league, and we’ll be better for what we achieved today,” Sills said. While Valentine return to Cahill Oval for their match against Maitland, Charlestown take on the Newcastle Jets Youth squad at Lisle Carr Oval, where both sides will be keen to take more than a single point after both sides found late equalizers in their matches.